Mark Delta, a. k. a. 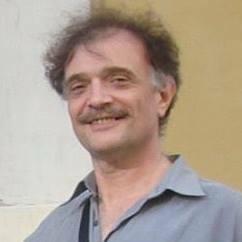 Mark Drachinsky, is a published writer, translator and language teacher. He was born in Georgia and lived in Israel since 1980s until 2002, where he worked as a Hebrew teacher, writer and translator. Currently, he resides in Moscow most of the time. This is Mark's homepage in Russian, maintained by himself, where you can find more detailed and up-to-date information about his writing, translations and teaching. Mark's fiction novel Orbinauts, published in 2011 by NLO, Moscow (a description in English is available here), was short-listed for the Portal-2012 literary prize in Russia. A summary of his other fiction writing is available on his Russian page. Yuri Trifonov, The House on the Embankment (הבית על גדת הנהר), Shoken, 1991, Tel-Aviv. Fedor Dostoyevsky, A Little Hero, published in the השטן והגיבורים collection, Eked-Gvanim, 1994, Tel-Aviv. Brothers Strugatsky, Roadside Picnic (הפיקניק בשולי הדרך), Zmora-Bitan, 1999, Tel-Aviv. Mark has also translated some of Boris Pasternak's poems into Hebrew. These translations were published in the literary supplement to HaAretz in the 1990s. He also translated Hebrew and English prose into Russian. Having learned Hebrew in his teenage years in the Soviet Union long before his aliyah, Mark taught Hebrew before his repatriation, and he worked as a teacher in an ulpan when he lived in Israel. Now, Mark gives private Hebrew classes over Skype. Currently, his schedule is full and he cannot take new students. We will keep you informed if he becomes available.